The first eight lines above contain a summary of the contents of this chapter of John. The actual 8th Chapter begins at the large 'A' ("And Jesus ..."). 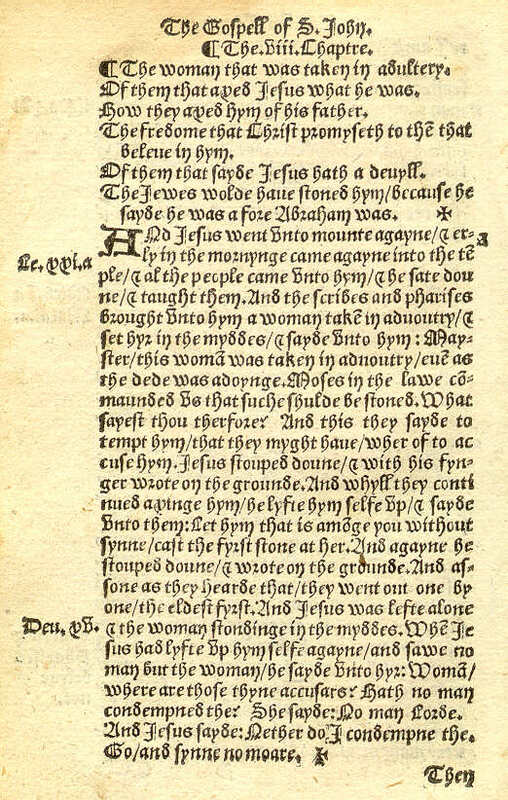 Since it's all of one typeface, its hard to tell Tyndale's notes from the Bible text. The actual page size is just 4-inches by 6-inches, which makes it the smallest Bible displayed on this Site. It was deliberately small to make it easier to smuggle into England. Some of the phrases used in the 1500's sound really quaint to us today. In the story above, the woman was caught in adultery -- "even as the deed was adoing." Use the Menu on the left to view another page from Tyndale's New Testament.